If you do not have time for baking chicken, no desire to sustain it in the marinade, and dinner time is approaching, then the output is - you can just cook the chicken in the pan. It is not only easy, but fast. If you want to cook the chicken in the pan, it is best to pre-cut into small pieces. Washed and dried with paper towels bird cut with a large knife. Set aside for now. Now we need to decide what you want to do with it – simmer or fry. If you want to put out, then proceed in the following way: in a pan with high sides (this is important!) pour a couple of tablespoons of vegetable oil and place it over high heat. While pan heats, RUB the chicken with a mixture of salt, black pepper and curry. Very helpful here is some kind of dried spice (Basil, marjoram, thyme, tarragon), it is also add to the rubbing. Lay the chicken into the pan and fry on strong fire from all sides. While the chicken is Golden, quickly slice onions, grate carrots. Tomatoes pour over boiling water and remove the skins, finely chop them. In a deep container, combine 2 cups water, tomatoes, onions, carrots, a half Cup of tomato juice. It is not forbidden to add crushed Bay leaf. Reduce under a hen the fire, fill the future with sauce, cover. Let them stew gently for an hour. If you forget about the contents of the pan for half an hour – anything terrible, the main thing – do not forget to check for fluid, it should not evaporate. If you want to roast the bird, then there is much easier. It also should be pre-cut into wings, legs, and breast. Every part of the chicken to RUB the following mixture: coarse sea salt, finely chopped garlic (2 cloves), black pepper, paprika (for frying will give amazing color). On a well heated pan spread the chicken and not covering it with a lid, fry from all sides. Fried chicken put in a container. The juice from the meat left in the pan, pour in the package of yogurt, add a tablespoon of tomato juice and a teaspoon of flour. Stirring occasionally, cook over medium heat until thick. Pour into a gravy boat and serve with chicken. This dish goes well with a light salad. Don't forget to reduce the fire while stewing chicken and ensure that the pan has always been fairly fluid. If you see that it's reduced, pour. Legs are very popular among Housewives. They are quick to prepare and does not require additional processing. There are a huge number of dishes using chicken legs. Try to surprise your loved ones Eastern dish. An unusual combination of herbs and spices will impress even the most sophisticated gourmet! Heat the oven to 180 degrees. Chicken legs wash and dry. Tear off the leaves of thyme. Clean the garlic and finely chop (you can grate). Mix the thyme with the honey, lemon juice and 2 table. tablespoons of olive oil. Add salt, pepper. 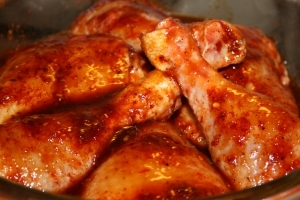 Cooked marinade coat the chicken legs and place on the grill of the oven (pre-substitute the bottom of the pan). Bake for 20 – 25 minutes. Pour rice 500 ml of water, add salt, turmeric and bring to a boil. Simmer 20 min. Prepare vegetables. Tomatoes wash and cut into 4 pieces. Spinach coarsely chop and fry along with the tomatoes in 1 table. the tablespoon of olive oil until all the liquid has evaporated. Chop olives and mix together with the raisins to the spinach with the tomatoes. Rice drain in a colander and combine with vegetables. Fried chicken legs with rice garnish Oriental is ready! Before you cook Oriental food, find out if everyone to tolerate spices. When cooking large legs can be chopped to 2 - 3 parts. In this form it is easier to serve the dish to the table. Before serving the dish, garnish it with fresh lettuce! 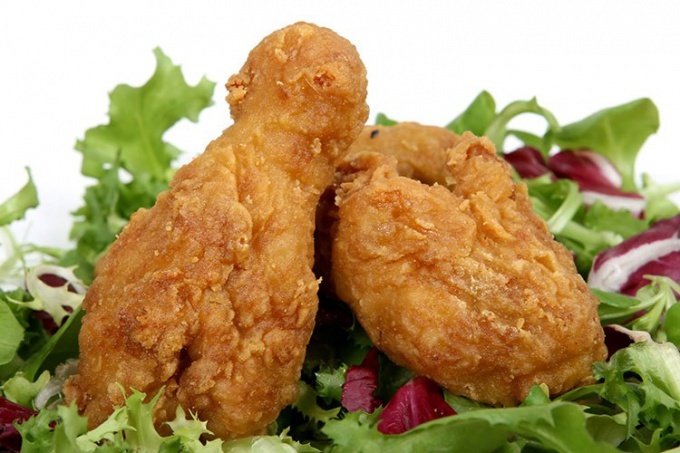 Chicken meat is one of the most popular and favorite products. Easy to prepare and delicious - those are its main advantages. Chicken diet product, but at the same time it is a rich source of protein. Chicken drumsticks can be rightly called the most delicious part of the chicken, because the preparation is obtained in moderately fat and very juicy. Wash the chicken drumsticks under running cool water. For cooking it is best to use fresh chilled meat, the dish will be more juicy. If you are using frozen drumsticks, before washing them must be defrosted at room temperature. Prepare the sauce. In a small bowl pour the soy sauce and lime juice, add dried herbs to taste. 5 chicken drumsticks you'll need 5-7 tbsp of soy sauce, 2-3 tablespoons of lime juice. 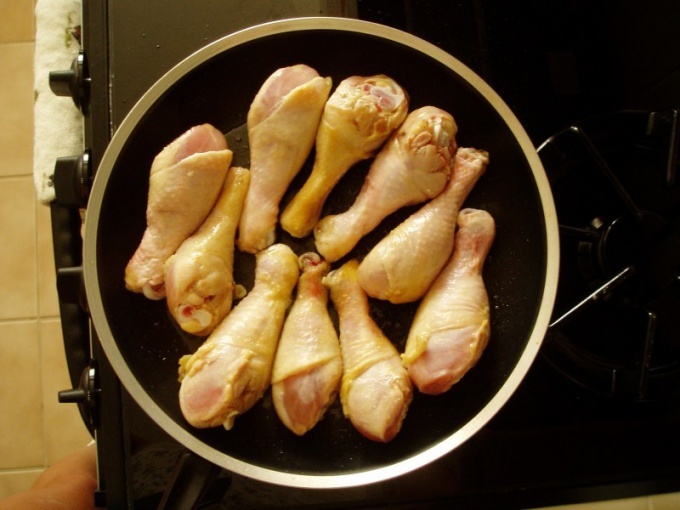 Place drumsticks on the preheated pan. It is best to use cookware with non-stick coating, which enables you to fry without oil. If you use an ordinary frying pan, pre-heat it a little vegetable oil (1-2 tablespoons), then put the meat. The tibia is most convenient to arrange, flesh at the same time to position closer to the edge of the pan, so they can be more fit. Calf fry on strong fire within minutes, then flip each piece and fry again for a minute. Reduce heat to medium. Pour over drumsticks cooked sauce. Add boiling water so that the liquid reached the middle of the thickness of the meat. When the liquid boils, reduce the heat to low and continue to simmer the chicken for about 40 minutes. Don't forget to rotate the lower leg from time to time. This will allow them to soak up the sauce. Serve chicken drumsticks with a side dish. 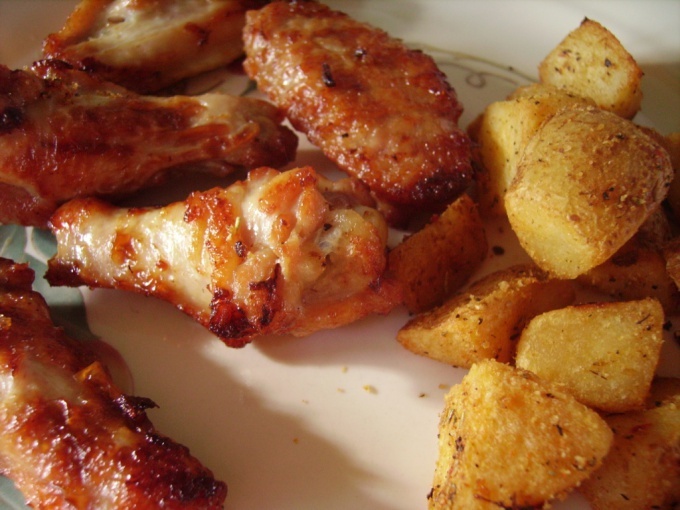 Best with chicken meat goes well with boiled or roasted potatoes. As a side dish well suited to the rice when serving it, you can pour the sauce in which meat was extinguished. Take chicken drumsticks, coated them with mustard, mayonnaise and spices (oregano, Basil, garlic, sesame seed, etc., more like) wrap in foil and into the oven for half an hour. Very tasty and quick. You can put chicken legs in a mild creamy sauce or fry them, pre-zamarinovat in a spicy spicy marinade, you can bake drumsticks in culinary sleeve, adding to them the tender juicy vegetables and then chicken legs with buckwheat porridge, cooked a delicious dish in old Russian style. Prepare the roast chicken is simple enough, and the result is not bad. But do not forget that chicken can be cooked a real delicacy, it is only necessary to connect the imagination and desire. fresh ground black pepper – to taste. Fried chicken with casecompare the chicken under running cold water, have in pieces: wings, legs and thighs in half, breast into 4 pieces, the back into 3-4 pieces. Cut the fat, but do not remove the skin, you can barely cut it. RUB the pieces with salt and pepper on all sides, tightly put in a bowl and refrigerate for 10 minutes. Preheat the pan, pour 4-5 tablespoons of refined vegetable oil, wait until the butter starts to boil, and then put into it some pieces of chicken skin side up. Fry on medium heat for 10-15 minutes, check that the pieces are not glued to the pan, move them from place to place so they are not burnt. Flip the pieces skin-side down and fry for a further 10-15 minutes, also stirring occasionally. Turn heat down if chicken starts to burn. Peel 3 cloves of garlic, crush them in chesnokodavilke or very finely chop with a knife. Garlic oil each piece of chicken and diatomite on low heat under a lid for 3-4 minutes. Flip the pieces, brush with garlic side down and diatomite for another 3-4 minutes. Fried chicken with honey and Cayenne personnalite into a bowl two tablespoons of Apple cider vinegar, add 100 milliliters of liquid honey and mix until smooth, you can do it with a blender or whisk. Rinse the chicken in cold water, cut the fat (you can remove the skin if you don't love her). Have the chicken in equal portions, put them in a bowl or pan and pour marinade – a mixture of vinegar and honey. Cover and refrigerate for 3-4 hours. Stir chicken about once an hour. Sift the flour into a bowl, add the breadcrumbs and Cayenne pepper, stir. In another bowl pour the chilled cream, add two eggs and lightly beat with a whisk. The mixture is supposed to be monochrome, with light bubbles. Take Tolstoganova pan heat 150 ml of vegetable oil is not higher than 150°C. Remove the chicken pieces from the marinade, dry them with paper towels, dip each piece into the egg mixture and cream, season with salt and pepper to taste, roll in mixture of flour, breadcrumbs and Cayenne pepper. Put the pieces (first the legs, thighs, wings) in a pan and fry for 5-7 minutes on each side to form a beautiful crust a light Golden color. Reduce heat and cook until tender 5-6 minutes. Then just cook the white meat and the back. Fry them 3-4 minutes on each side, and then on low heat for another 2-4 minutes. From chicken legs to cook the first dish. Soups with chicken are of excellent taste, and the Supplement can be pasta or vegetables. Soup from chicken feet and vermiculate cold water washed the chicken legs and place on high heat. Bring the water to a boil and reduce heat. Put in a pan the washed unpeeled onion and salt, it will add to the broth flavor and a nice Golden color. Cook legs and bow under the lid after half an hour, remove the onion from the soup, it is no longer needed. Peel the carrots and grate it on a coarse grater, potatoes cut into cubes. Send the vegetables in the broth from the chicken legs. They should be boiled for 10 minutes, then pour in the soup noodles and cook for another 15 minutes. Turn off the heat and season soup with chicken legs chopped dill. After 5 minutes, pour into soup bowls and place each on the half boiled eggs. Serve with white bread. Soup with chicken nochevieja chicken legs, cover with water and bring to a boil over high heat. When the water boils, add salt and reduce heat to simmer, cook the chicken on medium heat for another 30 minutes. Then remove the legs of the chicken from the broth and separate the meat from skin and bones. Cut the processed meat into small pieces. Cut potatoes into cubes, finely shred the cabbage, finely chop the tomatoes. Add the broth to the potatoes and boil for 15 minutes. Then send in a pot of cabbage, tomatoes and green peas. Will peel onion and cut into thin half-rings. Carrots grate on a coarse grater, bell pepper cut into small cubes. Add sauteed vegetables to chicken broth, toss the sliced meat and the Bay leaf. Simmer for 10 minutes, then pepper and salt the soup and turn off after 5 minutes. Leave the soup to stand 10 minutes. Pour the finished dish bowls, each add sour cream and herbs and serve the soup with black bread and garlic. When buying chicken, make sure the freshness of meat. Just press down on it with your finger - quality product should not remain dented.